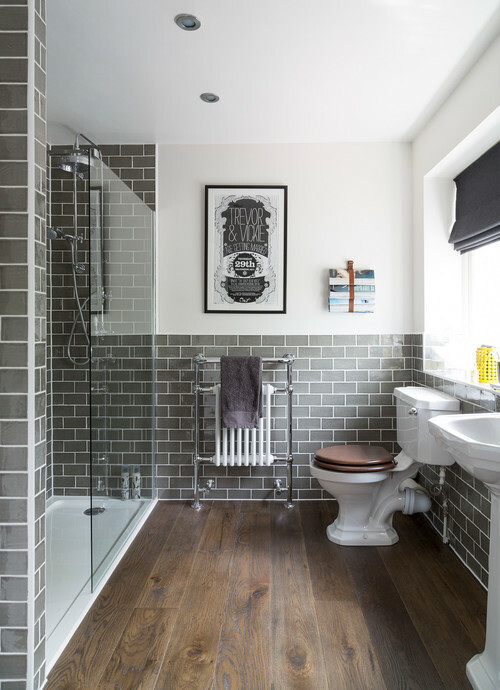 When it comes to improving the resale value of your home, seemingly small decisions — like bathroom tile — can make a big difference. Home buyers are influenced by first impressions, and high-traffic areas like bathrooms matter to them. Some flooring options are low on upkeep and high on durability, while others can’t handle heavy traffic and warp from frequent humidity. If you’re hoping to increase the resale value of your home, here are a few bathroom tile options that will help. While small tiles make for interesting trim and stylish niches, large-size tiles are still the dominant choice for bathroom flooring. They make bathroom spaces appear larger, and thanks to less grout lines, they’re also easier to keep clean. To increase the resale value of your bathroom, consider a remodel with large tiles in square or rectangular shapes. As is true for many resale decisions, neutral colors are a smart choice. Where wild colors may backfire with a buyer, neutral-colored tiles in white, cream, or light gray match any style or decor. For this reason, natural stone tiles are a timeless choice — one which increases the value of your home no matter how soon you plan to sell. While hardwood floors are a popular choice throughout the home these days, wood look tiles are a safer bet for improving resale value in the bathroom. They’re highly durable and low maintenance. Unlike natural hardwood floors, you don’t have to worry about them warping over time. They can give bathrooms a touch of warmth in chestnut tones or a cool coastal feel in gray. Whether you’re looking to sell your home soon or years from now, new tile is one way a bathroom remodel can help increase the resale value of your home. To reinvigorate your bathroom, contact us at Crystal Bath & Shower Company. Our designers and installers will help you find bathroom tile you and your future homebuyer will love.